Go to original pattern for design DROPS 98-35. Drops double pointed needles size 4.5 mm or size needed to obtain the correct knitting tension. Knitting Tension: 18 sts x 23 rows on needles size 4.5 mm in double thread Alpaca and stocking sts = 10 x 10 cm. 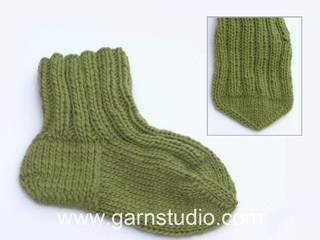 Tube socks: Cast on 42-48-54 sts on double pointed needles size 4.5 mm with 1 thread of each colour. Knit 2 cm Rib. Now knit 1 round displacing the Rib 1 st to the left: over K3/P3 it’ll become P1/K3/P2. *Knit 1 round with K over K and P over P and then displace the Rib again 1 st to the left*, repeat from *-* until the piece measures 42-43-47 cm. Now insert a marking thread each side = 21-24-27 sts in between each marking thread. 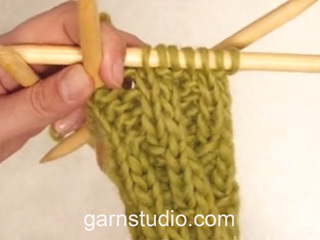 Continue in Rib (this means K over K and P over P without any displacement) at the same time dec for the toe as follows 3 sts before each marking thread: K2 tog, K2 (the MT is between these 2 sts), slip 1 st as if to knit, psso. Dec. on every other row a total of 3 times and then on every row a total of 5-6-7 times = 19-12-14 sts left on row. On the following row K all sts tog 2 by 2. Cut the thread and pull it through the remaining 5-6-7 sts two times and sew the thread. The sock measures approx. 46-48-52 cm. Bonjour Mme Svanda, on tricote ici avec 1 fil de chaque couleur en même temps, comme s'il n'y en avait qu'un. Vous pouvez tricoter avec les mailles sur 4 aiguilles et tricoter avec la 5ème ou les répartir sur 3 et tricoter avec la 4ème. Bon tricot ! Als ik aan het einde van het patroon ben is mijn rondbreinaald te groot voor de sokken. Ik heb nu nog 20 steken op de naald staan, maar hij zit nu te strak om te breien. Hoe kan ik mijn sok afmaken? Dem må jeg bare have! Fine sokker - tag dem med! Flotte hjemmehyggesokker, de må bare med. Nydelige- regnværdager blir ikke det samme med slike myke sokker på bena. Ta de med !